How about a large ooey-gooey eggplant pizza for his Holiness? Why is it that spiritual teachers must always originate from the Orient or remote parts of Tibet? I mean, when somebody from England, Germany or America tries to spearhead a spiritual movement, they are always called a cult leader. Or at best, a kook! When you hear the word “lama”, it’s always in reference to a high priest, a holy guide or a venerated spiritual master. In my neck of the woods, someone who meets that definition typically has his own televangelist show. But what if the Western world produced a bonafide holy man who grew up on Happy Meals and music videos? Would he be embraced as a source of great wisdom or rejected as an impious fraud? Thanks to Doctor Strange, we’ll learn just how such an occurrence might come about! The title of Doctor Strange lasted more than 180 issues in its first incarnation and surpassed 80 issues in its second. During that time, he investigated occult instances of all sort, ranging from haunted houses to demonic incursions. Strange took on more than one apprentice and worked with spandex-clad superheroes in The Defenders, all while he earned, lost and re-gained the title of Sorcerer Supreme. While he was famously produced in his early days as “Dr. Strange, Master of Black Magic” by Stan Lee and Steve Ditko, he is perhaps most well known due to the works of Steve Englehart and Gene Colan. 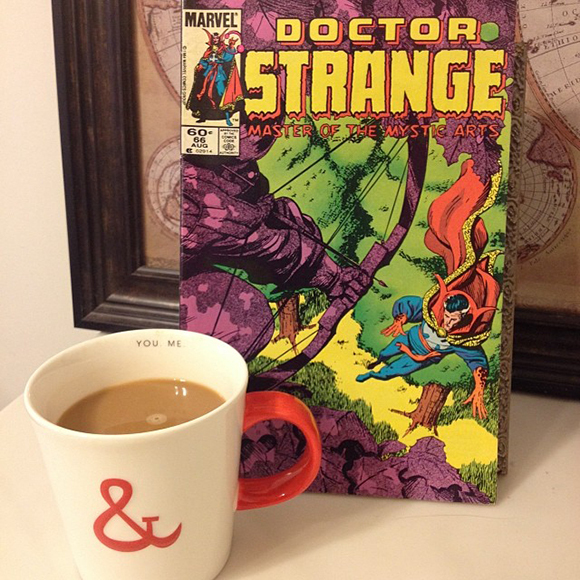 It was this duo which made Strange into a superstar who captured the imaginations of readers of all ages. His adventures took on surreal, serious and semi-adult themes and provoked a full range of emotions with both his words and actions. It wasn’t long after these legendary creators left the title that it came to an end, but not before Strange suffered many losses which would impact his continuing adventures later in Strange Tales. The good doctor returns from another adventure to find his services in need by a trio of monks of a holy order from the Far East. They have been searching for the last quarter century for the reincarnation of their high lama. Desperate for his leadership, they beseech Doctor Strange to use his power to aid in their search. Thanks to his all-seeing mystic Orb of Agamotto, he does not need to look far and he locates the spiritual energy of their saintly leader’s spirit on the Island of Manhattan! His pursuit leads him to a nearby country club where he finds himself working undercover as a golfer as he tries to find the lama. While searching for his golf ball, however, Strange encounters a 20-something groundskeeper who somehow notices the mystic Eye of Agamotto on Strange’s neck, despite the disguise of the wizard’s illusion spell. A quick probing of the kid’s aura and the Master of the Mystic Arts knows that his search is concluded – this is the chosen one! He has never before doubted the powers of his amulet, but the Sorcerer Supreme must evaluate young Arnie Green before naming him as the order’s long-lost lama. He sends word back to his Sanctum Sanctorum and his faithful manservant, Wong, prepares transportation to bring the monks to Arnie’s apartment. During their discussion, Arnie begins to see further through Strange’s illusion spell, so the good doctor reveals himself altogether. A few more signs of the boy’s abilities proceed, like how he always seems to have exact change for his pizza delivery (he’s perpetually lucky) and he nearly calls forth the Eye of Agamotto when examining Strange’s amulet. When the monks arrive, they are aghast at the idea that their high lama has been reincarnated as a Westerner! Their tests of him, however, go without a single failure. When all seems to be going smoothly, an assassin’s arrow burst through the window, striking Arnie’s reflection in the mirror (further evidence of the boy’s “lucky streak”). Strange takes off after the assassin, who proves to be a well-trained enemy, evading the Sorcerer Supreme’s pursuit. When the two finally meet, they end up careening above the tree-tops thanks to Strange’s Cloak of Levitation, where he uses the Eye of Agamotto to discern the truth from the assassin. It turns out that he is Jigme, a member of the holy order, sent to protect the high lama from Danu, a rogue monk who was about to kill the chosen one within his apartment! Danu renders his two fellow monks unconscious as soon as Strange left them alone, and now he holds a blade directed at Arnie, ready to slay the boy! He believes that Western decadence is sure to have corrupted their holy leader, so the body must die so that “the lama may be born again, purging this horrible experience from his karma”. As he prepares to plunge the blade forward, he is suddenly rebuked as the mystic Winds of Watoomb blow Arnie’s door from its hinges, signaling the return of the Master of the Mystic Arts! Desperate, Danu grabs Arnie and holds the blade to his throat, but that’s when the high lama’s consciousness awakens in a brilliant blaze, flinging Danu back. The display of the holy one’s might does little to dissuade Danu from his task as he hurls his blade straight at the chosen one’s gut and leaps out of the second-story window. Doctor Strange reacts with the speed of thought, using his magic cloak to grasp the blade a split second before it strike’s the boy’s body. Danu breaks his ankle upon landing and finds the bow and arrow of Jigme pointed right at his head. Arnie halts the execution, however, calling for mercy and forgiveness as his order has always practiced. The lama’s consciousness is now fully awake and he saves his errant student from Jigme’s bow with his ways of peace. They tend to Damu’s injury and Damu is overcome with regret, begging for forgiveness, which the high lama grants without hesitation. Arnie embraces all the members of his order with compassion and love and decides that it is time to head home, although where the monks call “home” remains an unspoken mystery. It is explained that the lama was reborn in the West by design so that he could learn about the ever-changing world. It goes without saying, however, that leaving the U.S. is going to create some serious withdrawal. So rather than go “cold turkey”, Arnie has a satellite dish loaded onto their homebound plane as he dons a “MTV” baseball cap and plans to introduce his order to “the enlightenment of cable TV and pizza … with extra cheese!”. Thus ends our tale with all the seriousness of a sitcom, yet fun and enjoyable all the same. The artwork in this era of comics is relatively bright, which is not bad, although I prefer the shadows and moodiness of Gene Colan’s work on the title. With all this talk about pizza, however, I certainly wouldn’t blame you if your stomach began craving something other than a cup of your favorite morning brew. Until the spirit of your own spiritual leader is reborn in the body of Howard the Duck, I bid you happy reading, true believers, and Fare Thee Well! Doctor Strange #66 is written by Roger Stern, penciled by Paul Smith, inked by Terry Austin, lettered by Jim Novak, colored by Bob Sharen and edited by Carl Potts,with a cover by Paul Smith.